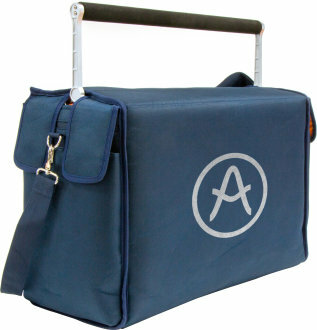 Transport your synthesizer in style. Once folded down into transport mode, your RackBrute 3U or 6U, along with your MiniBrute 2 or 2S, will fit snugly inside this high-quality Arturia padded bag. It also features external compartments for adapters or small controllers. Fully loaded modular cases can get heavy, so Arturia included a hard-wearing shoulder strap to make things a little easier. The perfect cross-sale to any musician on the move, who just entered the MiniBrute 2 world. Along with its elegant design, the RackBrute Travel Bag offers high quality couture standards, with solid zipper material, making it the complete choice for your set. With its reinforced packaging and smart ergonomics, the Travel Bag brings safety to your gears in different environments. Available until 11 PM (EST) today. Mention special code 207-70NR when you call.